Viktory with wreath seated above stadium. 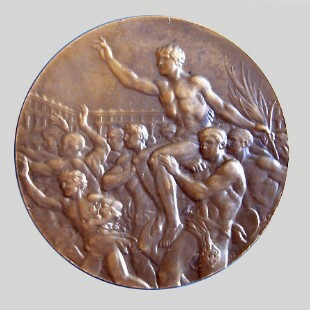 The design for the prize medals which was adopted by the International Olympic Committee for the Amsterdam Games in 1928 and struck for each subsequent Games, was again agreed upon. The original design was modelled by Professor Cassiole of Florence, Italy. 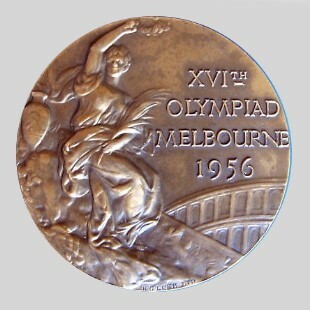 The only alteration was to change the appropriate wording to " XVIth Olympiad Melbourne 1956". Winners of individual events and members of winning teams were awarded silver-gilt medals ; second and third in each category were awarded silver and bronze medals respectively.
" . . . In team events only members of the first, second and third teams who have participated in the final or 3rd-4th match respectively shall be awarded the silver-gilt medals, silver medals and bronze medals and diplomas. Those who have represented the first, second and third teams but have not participated in the final or 3rd-4th match are entitled to receive a diploma. No competitor shall receive more than one medal for the same performance in a combined individual and team competition." It was the intention of the I.O.C. that this rule should apply to Melbourne, but as it had not been enforced for the equestrian events at Stockholm, which formed an integral part of the Games of the XVI Olympiad, it was therefore decided that the old rule whereby athletes were entitled to more than one medal for the same performance should also apply at Melbourne. This rule, however, merits careful study with a view to clearer expression for future organizers since it contains ambiguities ; in boxing, for instance, the losing semi-finalists in each weight category do not fight off for third place and are judged to be equal third. There are, moreover, different views as to what constitutes a reserve. Only by defining in the rule those sports which are entitled to claim additional medals, will the anomalies be rectified. It should also be defined which are the team events. Are eights, fours and pairs, for example, in rowing to be classified as team events ? Similarly, why are pairs in canoeing classified as team events and the tandem event in cycling as an individual event ? In gymnastics team events, more competitors than the scoring number of five are allowed to compete in a team. Should those which follow the scoring five in a team be awarded medals or should they be treated as reserves ? The I.O.C. 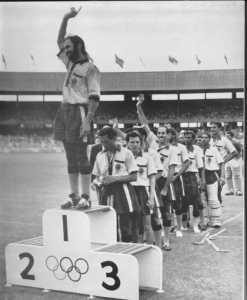 new Rule 41 which lays down that medals must bear the name of the sport concerned, was brought into operation in June, 1956. As the prize medals had already been manufactured by this time, the President of the I.O.C. agreed that this section of the rule should be waived for the Melbourne Games. Prize medals were ordered and distributed as follows : silver-gilt ordered, 280, distributed, 273 ; silver ordered, 280, distributed, 273 ; bronze ordered, 290, distributed, 281. Additional bronze medals were required because the I.O.C. ruled that both of the losing semi-finalists in each weight category of boxing should receive bronze medals rather than fight a deciding bout. Prize medals were presented in velvet-lined cases. The cases were cream with a label in blue for first, in red for second and in green for third.